Pretty pink blooms: 5 pre-made clip art items plus 2 seamless patterns. Are you looking for a delicate floral design for wedding stationery? Do you have a pink color scheme? 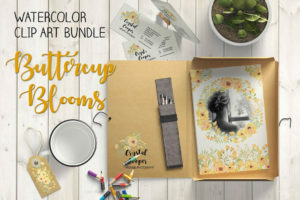 Then this watercolor mini clip art bundle is just the thing! These dainty florals will inspire your creativity and add a splash of color to your designs. Ideal for all types of design projects and paper-based crafts such as wedding stationery, scrap booking, decoupage, card making, and much more! – oval card / page template. The 2 parts of the main wreath are also given as separate clip art items – a small spray and a laurel wreath. The oval template is given in 3 sizes. Both wreaths measure 10 X 10 inches (3000 X 3000 pixels). Sprays 1 and 2 measure 8 X 8 inches (2400 X 2400 pixels). The oval template is given in 3 sizes: 8 X 10 inches (2400 X 3000 pixels); 7.5 X 10.5 inches (2250 X 3150 pixels), and US letter size (2550 X 3300 pixels). The patterns measure 12 X 12 inches (3600 X 3600 pixels). 1 zipped folder is immediately available on purchase, containing all the clip art items and the patterns (JPEG and PNG) – 22 files in total.